The Dolgin Engineering TC400 simultaneously charges up to four select Sony-type NP-FZ100 battery packs. It will charge batteries in about 2.5 hours when all four charging bays are filled. Additionally, each battery bay is independent, meaning that batteries can be added and removed at any time. An LCD display provides information on the charging status of each battery. It provides the information in volts, Ah, and percent of charge, with the percentage of charge being estimated via a proprietary algorithm. This charger is compatible with worldwide power, supporting 100-240 VAC or 12 VDC car power. The included external AC adapter is specifically made for the charger, do not use other AC adapters in its place. Replacement AC adapters are available. 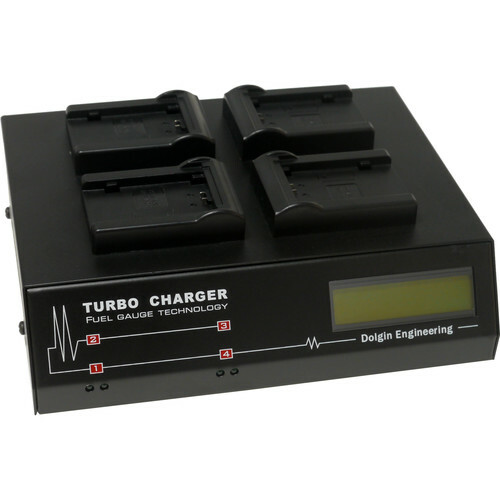 The charger features an integrated LCD screen that displays the battery's volts, Ah (as computed by the charger fuel gauge), and the battery capacity (if fully discharged before insertion).